Jhaveri Microbiology Centre, L.V. Prasad Eye Institute, Hyderabad, India. Purpose: We describe a simple procedure of Immunoperoxidase (IP) technique, using indigenously raised antibody, to screen corneal scrapings for Acanthamoeba cysts and trophozoites. This study sought to determine the utility of this test in the diagnosis of Acanthamoeba keratitis. Methods: A high titre polyclonal antibody against a local clinical isolate (axenic) of Acanthamoeba species (trophozoite lysate antigen) was raised in rabbits and used for standardization of IP technique for corneal scrapings. Twenty two smears of corneal scrapings, collected from patients showing Acanthamoeba cysts in corneal scrapings stained with calcofluorwhite (pool-1) and patients showing no cysts in similar scrapings (pool-2), were coded and stained by IP technique by a masked technician. All 22 patients had also been tested for bacteria, fungus, and Acanthamoeba in their corneal scrapings by smears and cultures. IP stained smears were examined for organisms including cysts and trophozoites of Acanthamoeba and background staining by two observers masked to the results of other smears and cultures. The validity of the IP test in detection of Acanthamoeba cysts and trophozoites was measured by sensitivity, specificity, positive predictive value and negative predictive value in comparison (McNemar test for paired comparison) with calcofluor white staining and culture. Results: Based on the readings of observer 1 and compared to calcofluor white staining, the IP test had a sensitivity of 100%, a specificity of 94%, positive predictive value of 80% and negative predictive value of 100%. When compared to culture, the values were 83%, 100%, 100% and 94% respectively. Trophozoites missed in calcofluor white stained smears, were detected in 2 out of 6 cases of culture-positive Acanthamoeba keratitis. The Kappa coefficient of interobserver agreement was determined as fair (30.4%). Conclusion: The immunoperoxidase technique is a simple and useful test in the diagnosis of Acanthamoeba keratitis. This can supplement the culture results. Acanthamoeba species are an important cause of microbial keratitis that may cause severe ocular inflammation and visual loss. Diagnosis of Acanthamoeba keratitis is based on both clinical features and laboratory tests. Corneal scrapings collected under topical anaesthesia can be examined by various methods as well as cultured for the organism on non-nutrient agar seeded with Escherichia coli. Smear examination of the wet mount of corneal scraping is preferred over dry smears. A variety of stains are said to stain the organisms, [2, 3] but only cysts owing to their characteristic stellate and double walled structure are well recognized in corneal scrapings. The cysts can be recognized even in unstained preparations such as wet mount with 10% potassium hydroxide. On the other hand, the trophozoites are often difficult to distinguish because of their irregular shape and resemblance to tissue macrophages[4-6] even in stained preparations. In most patients of Acanthamoeba keratitis, the corneal scrapings are likely to consist of a mixed population of cysts and trophozoites of Acanthamoeba. A technique that would detect both cysts and trophozoites may greatly enhance the chances of diagnosis of Acanthamoeba keratitis compared to those which delineate the Acanthamoeba cyst alone. 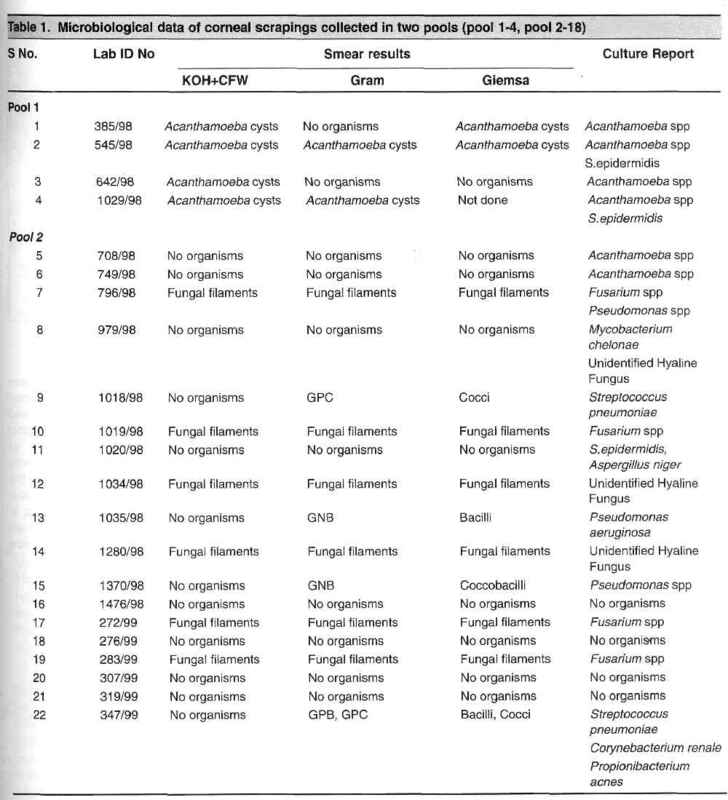 Microscopy for Acanthamoeba cysts (Gram, Giemsa, Calcufluor white stains) was positive in 70 of 88 (79.6%) of culture-proven cases investigated between January 1991, through December 1999. A more sensitive technique detecting both cysts and trophozoites might have led to 100% positive microscopy. This study sought to indigenously raise an antibody to Acanthamoeba trophozoite and evaluate it in an immunoperoxidase staining technique, done on corneal scrapings for the diagnosis of Acanthamoeba keratitis. We expected to identify cysts as well as trophozoites of Acanthamoeba in the corneal scrapings by this method the former by virtue of characteristic morphology and latter by specific staining. The results obtained by this technique were compared with the results of microscopy (calcofluor white staining) and culture of the corneal scrapings. Acanthamoeba trophozoite lysate antigen prepared by sonication of axenic culture of a clinical isolate of Acanthamoeba from a patient with Acanthamoeba keratitis (L402/97) was used along with incomplete Freund's adjuvant for immunizing rabbits. Four dosages (intramuscular) were administered at 15-20 days' intervals over two and half months. Pre-immune and post-immune sera were tested by checker board titration by an enzymelinked immunosorbent assay. Post-immune serum sample with an antibody titre of ≥25,600 was selected for the immunoperoxidase (IP) staining of the corneal scrapings. 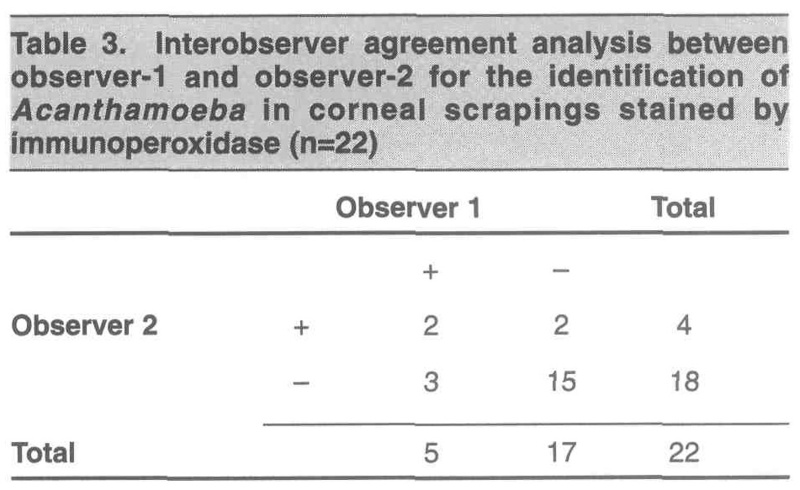 The optimal IP staining procedure was standardised using various dilutions of the antibody and the pre-immune serum (as a negative control) on corneal epithelial cells (collected from patients undergoing photorefractive keratectomy) mixed with Acanthamoeba trophozoites and cysts from axenic culture. On the basis of specific brown staining of Acanthamoeba trophozoites and blue counter staining of other cells a dilution of 1 in 150 was considered optimal. The IP procedure is briefly outlined in [Figure - 1]. Between April 1998 and March 1999, 706 patients with keratitis of possible microbial aetiology were seen by us. All patients were subjected to microbiological evaluation of corneal scrapings according to the methodology described by us earlier. The protocol included evaluation of three smears stained by calcofluor white with potassium hydroxide, Gram stain and Giemsa (Diff Quik)R stain and culture media for isolation of Acanthamobea, bacteria (aerobic and anaerobic), and fungus. 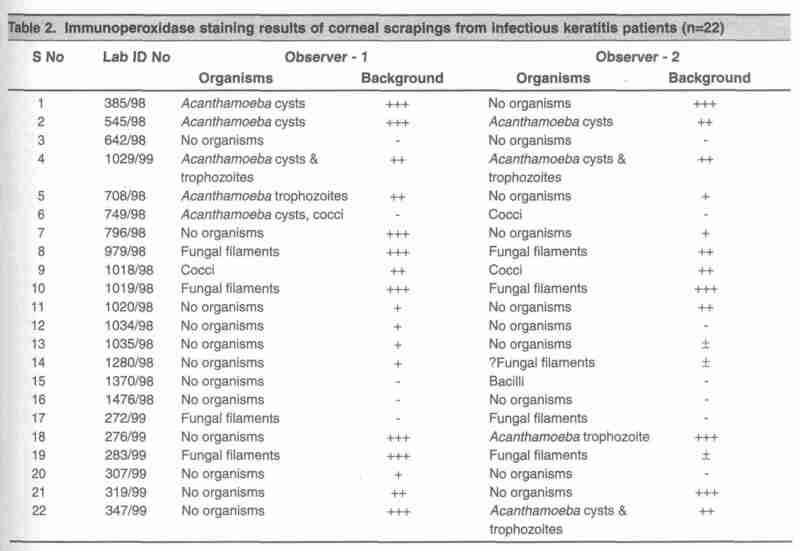 Two pools of extra smears of corneal scraping on glass slides were collected from some of these patients, Pool 1 were cases showing Acanthamoeba cysts in corneal scrapings stained with calcofluor white and Pool 2 were cases showing no cysts in similar scrapings [Table - 1]. These smears (Pool 1, n=4, Pool 2, n=18) were air dried, fixed for 30 minutes in cold acetone (-20°C), and stored at -70°C until tested by the IP technique. Slides from pool 1 and 2 were mixed and coded by the technician (MAUR) (masked to the origin of the smears) and stained by IP technique as outlined in [Figure - 1]. Following IP staining the smears were examined by two investigators (SS, SA) masked to the clinical and microbiological results related to the samples. The coded smears were examined under light microscope (χlOO, χ500 magnification) independently by both investigators for the presence of Acanthamoeba cysts and/or trophozoites, and other organisms, and for background staining of epithelial and inflammatory cells. Structures morphologically resembling cysts (blue polygonal double wall with unstained centre) or trophozoites (brown) of Acanthamoeba [Figure:2a], [Figure:2b], were looked for in all the smears. Any brown staining of epithelial cells, inflammatory cells and other background structures was considered as background staining. The background staining was graded using a mutually accepted arbitrary scale as + (mild), ++ (moderate), and +++ (heavy) by both the observers. Presence of organisms such as fungus or bacteria was also noted. A total of 22 corneal scrapings in two pools were included in this study. Inclusion of corneal scraping smears in two pools was based on the detection of Acanthamoeba cysts in any of the three smears examined. Scrapings from 4 of 22 patients showed cysts and were included in Pool 1. The scrapings from the remaining 18 patients did not show Acanthamoeba cysts in any of the smears, therefore, the extra smears; from these cases were stocked as Pool 2. The results of smears and culture of corneal scrapings from all 22 cases included in this study are shown in [Table - 1]. [Table - 2] shows the IP stain findings of all 22 smears by both observers. Observer 1 detected Acanthamoeba cysts and/or trophozoites of by IP test in 5 of six culture-positive Acanthamoeba keratitis cases. Four of these 5 cases had shown cysts in calcofluor white stained corneal scrapings. On the other hand, observer 2 read four corneal scrapings positive for Acanthamoeba cysts and/ or trophozoites by IP test; two were positive in culture and calcofluor white and two were false positive (No.18 and 22). The sensitivity, specificity and predictive values (positive and negative) of IP stain (observer 1), in the detection of Acanthamoeba in corneal scrapings, in comparison to calcofluor white stain and culture are shown in [Figure - 3]. An agreement analysis between two observers, measured as the 'kappa coefficient (SPSS, Release 9.0,1999, SPSS Inc, Chicago, IL, USA) was 30.4%. This was graded statistically as a fair agreement [Table - 3]. Early and accurate detection of Acanthamoeba is essential for proper management of Acanthamoeba keratitis. Most cases of Acanthamoeba keratitis have been diagnosed through examination of stained corneal scrapings and culture. A variety of stains such as hematoxylin-eosin, Periodic acid-schiff, Giemsa, Wright's, Masson's trichrome, Heidenhain's, Iron hematoxylin-eosin, Hemacolor, Gomori methenamine silver, Wilder's reticulum, Bauer chromic acid, Gram, and Lactophenol cotton blue have been shown to stain. [2, 3] Currently the fabric whitener calcofluor white with Evan's blue is the most widely used stain. We routinely employ calcofluor white with potassium hydroxide and Evan's blue (KOH + CFW) for examination of corneal scrapings from clinically non-viral keratitis patients seen at our center. In a recent analysis of Acanthamoeba keratitis, 34 of 39 cases (87.1%) were positive by KOH+CFW method. In 5 patients the smears was negative and the culture was positive. In another analysis, the smear was negative in 20.4% (18/88) of 88 culture-positive cases (unpublished data). Thus despite good sensitivity and specificity of KOH+CFW in the diagnosis of Acanthamoeba keratitis some cases may yield false negatives due to presence of trophozoites alone in the corneal scraping. [Figure - 4] demonstrates that the cysts are seen well while trophozoites fail to show fluorescence in a calcofluor white preparation of culture of Acanthamoeba with mixed population of cysts and trophozoites. This study was an attempt to indigenously develop an antibody to trophozoite antigen, standardise an immunoperoxidase test using this antibody and finally utilize the test to demonstrate trophozoites and cysts of Acanthamoeba. Immunostaining techniques with indirect fluorescent antibody or immunoperoxidase technique for demonstration of Acanthamoeba have been used in the past. The former has been used mainly for species determination and diagnosis of occasional cases and the latter for an isolated case. Also, a suggestion as to the utility of immunostaining in conjunction with culture to improve the laboratory diagnosis has been made a few years ago. In this study, we have shown the utility of immunoperoxidase staining of corneal scrapings in the diagnosis of Acanthamoeba keratitis. While four cases were diagnosed using KOH+CFW, five cases were detected in smears by IP staining by observer 1. In two out of five cases trophozoites were detected in the smears [Table - 2]. However, despite increased sensitivity, the IP staining could not detect all 6 culture-positive cases. While the IP staining seems to compare well with CFW [Figure - 3] and in addition detects trophozoites, it still needs to be used in conjunction with culture. We firmly believe that a combination of diagnostic methods is likely to yield better results than any single method since sample variation may also account for variation in results and may affect the sensitivity and specificity. Technically, the IP staining is simple, can be completed in 4-5 hours, and given the availability of the antibody the test can be easily adapted in any ocular microbiology laboratory. The study had three weaknesses. Firstly like other immunocyto-chemical methods, the immuno-peroxidase method can often be problematic with background staining. Both observers in this study noted variable amount of background staining of epithelial cells, polymorphs and tissue debris. But it did not seem to interfere with the recognition of Acanthamoeba cysts and trophozoites. Secondly, the concurrence between two observers in this study was statistically rated fair [Table - 3] and implies that a certain amount of expertise and familiarity with the organism, is essential to interpret the results. The possibility of false positives, as seen with observer 2 [Table - 2], also needs to be kept in mind. This can possibly be avoided by employing methods such as affinity purification of polyclonal antibody preparation. The other weakness of the study was the small sample size. In conclusion, we have raised and tested a polyclonal antibody in an immunoperoxidase technique which helped identify Acanthamoeba trophozoites in corneal scrapings without limiting the visualisation of cysts. We have also demonstrated that IP staining along with KOH+CFW staining and culture could provide a good laboratory modality for the diagnosis of Acanthamoeba keratitis. However, the commercial non-availability of the antibody might preclude usage of this technique by some laboratories in view of the high cost involved in raising antibodies. Kilvington S, Larkin DF, White DG, Beeching JR. Laboratory investigation of Acanthamoeba keratitis. J Clin Microbiol 1990;28:2722-2725. Auran JD, Starr MB, Jakobiec FA. Acanthamoeba keratitis: A review of literature. Cornea 1987;6:2-26. Thomas PA, Kuriakose T. Rapid detection of Acanthamoeba cysts in corneal scrapings by lactophenol cotton blue staining. Arch Ophthalmol 1990;108:168. Sharma S, Srinivasan M, George C. Acanthamoeba keratitis in non-contact lens wearers. Arch Ophthalmol 1990;108:676-678. Illingworth CD, Cook SD. Acanthameoba keratitis. Surv Ophthalmol 1998;42:493-508. Wilhelmus KR, Liesegang TJ, Osato MS, Jones DB. Laboratory diagnosis of ocular infections in Cumitech 13A. Specter SC, (editor): Washington DC, Am Soc Microbiol, 1994, p. 17. Harlow E, Lane D. Immunizing animals, chapter 5. In Antibodies: A Laboratory Manual. Cold Spring Harbor Laboratory; New York, 1988:92-110. Kunimoto DY, Sharma S, Garg P, Gopinathan U, Miller D, Rao GN. Corneal ulceration in the elderly in Hyderabad, South India. Br J Ophthalmol 2000;84:54-59. Wilhelmus KR, Osato MS, Font RL, Robinson NM, Jones DB. Rapid diagnosis of Acanthamoeba keratitis using calcofluor white. Arch Ophthalmol 1986;104:1309-1312. Sharma S, Garg P, Rao GN. Patient characteristics, diagnosis and treatment of non-contact lens related Acanthamoeba keratitis. Br J Ophthalmology 2000; (In press). Epstein RJ, Wilson LA, Visvesvara GS, Plourde EG Jr. Rapid diagnosis of Acanthamoeba keratitis from corneal scrapings using indirect fluorescent antibody staining. Arch Ophthalmol 1986;104:1318-1321. Blackman HJ, Rao NA, Lemp MA, Visvesvara GS. Acanthamoeba keratitis successfully treated with penetrating keratoplasty: Suggested immunogenic mechanisms of action. Cornea 1984;3:125-130. Duguid IGM, Morlet N, Mathieson M, Cree IA, Dart JKG. Histopathology is of value in the diagnosis of Acanthamoeba keratitis (abstract). Invest Ophthalmol Vis Sci 36:S326, 1995. Sharma S, Silverberg M, Mehta P, Gopinathan U, Agarwal V, Naduvilath TJ. Early diagnosis of mycotic keratitis: Predictive value of Potassium Hydroxide preparation. Indian J Ophthalmol 1998;46:31-35. Coligan JE, Kruisbeek AM, Margulies DH, Shevach EM, Strober W. Current protocols in immunology Volume 1, Current Protocols: Greene & Wiley. National Institute of Health (USA), 1994:5.8.5. Lek-Uthai, U., Passara, R., Roongruangchai, K., Buddhirakkul, P., Thammapalerd, N.
Pasricha, G., Sharma, S., Garg, P., Aggarwal, R.K.